If there’s something strange in your neighborhood, we know who you’re gonna’ call: Ghostbusters! The Ghostbusters have seen many reiterations in media, from the 1984 original movie (starring comedy bigshots Dan Akyroid, Bill Murray, along with Harold Ramis, Rick Moranis, and Sigourney Weaver), to the 80’s cartoon based on the movie, to the most recent female-cast remake. Funny, spirited, and the definition of an ensemble, Ghostbusters are widely beloved, from kids to adults. We’ve gathered ten of our favorite Ghostbusters toys here for you to peruse. Whether you’re young in years or just at heart, we think you’ll love these top picks! We here at Born Cute know that some of your favorites are in high demand! That’s why we’ve recently revisited this page and revised our selections to make sure that none of our items are low in stock and that all of them truly do reflect all the action-packed fun of the Ghostbusters. Despite being rooted in '80s pop culture, a new release of the Ghostbusters movie has established a new generation of fans. Indulge in your child's affections for Ghostbusters-related toys with one of the products on our recently updated top 10 list. In addition to new producst, all product information--details, specifications, age ranges, cost and availability have been reviewed and verified as accurate. In case you haven’t noticed, busting ghosts and other forms of ectoplasmic creatures is not exactly an easy job. Even with the genius of Egon and the audacity of Peter, ghostbusting will simply be an exercise in futility without their proton pack. 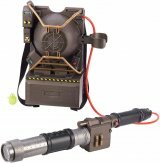 This gadget that our quartet slings over their backs, like some gizmo that exterminators wear during fogging operations, is one of the most important pieces of technology that all ghost-busters have to have so that they will be more successful in their exploits. This includes children who are training to become the next Egon, Ray, Peter, and Winston. 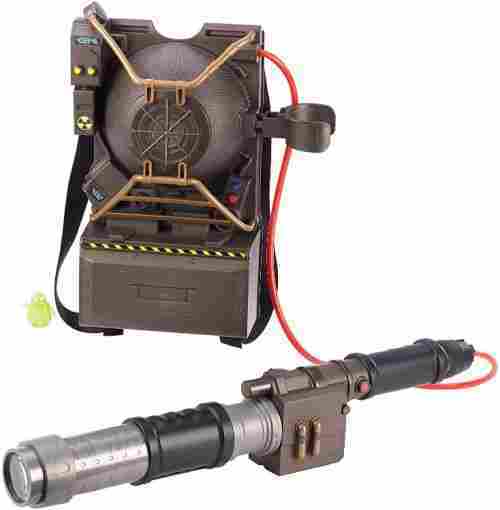 As such, to aid children in their training, they will need the Ghostbusters Electronic Proton Pack Projector to give them an almost realistic training simulation. 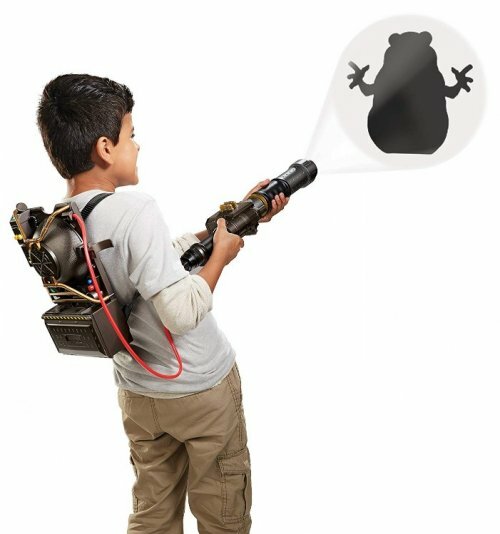 The Proton Pack Projector comes with a blaster that will surely elevate the role playing activities of young GB fans, giving them superb imagination as they try to hunt down ghosts and other ectoplasmic organisms. The Proton Pack slings on the back like the real ghost hunters do. It also comes with a blaster with authentic details as well as functions that everyone will love. Insert a ghost mini figure into the chamber of the blaster and project the ghost’s silhouette on your wall. 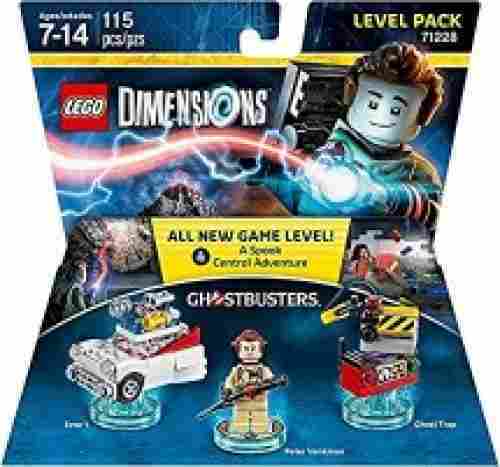 You can purchase other ghost mini figures as well to complete the ghost busting adventures of your child. Maybe your kid has convinced you that there is a ghost problem in your home, and it is literally scaring them each night. 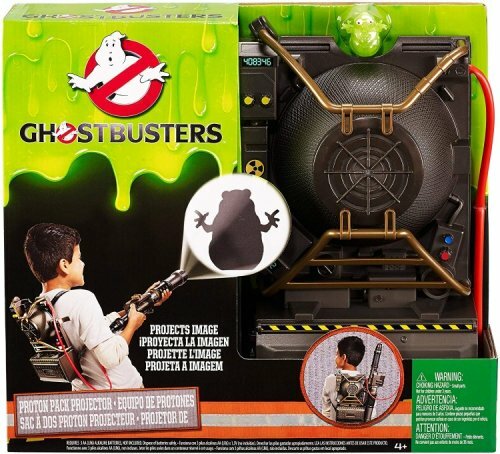 Well, worry no more, this Ghostbusters Electronic Proton Pack Projector by Mattel is the most effective ghost remover out there! With this Proton Pack kids can experiment with making decisions and enhancing their social skills. Role play may seem like a fairly simple activity, however through the process of role playing, kids can learn practical life skills such as how to interact with others, change their tone of voice and how to reenact scenes. As your kid is fighting off ghosts with this toy, they will be stimulating their visual and tactile sensories. If your family likes NERF guns (and who doesn’t? ), this little blaster will thrill them. It has a long range, it’s easy for even young kids to load and shoot themselves, and it’s pretty powerful. 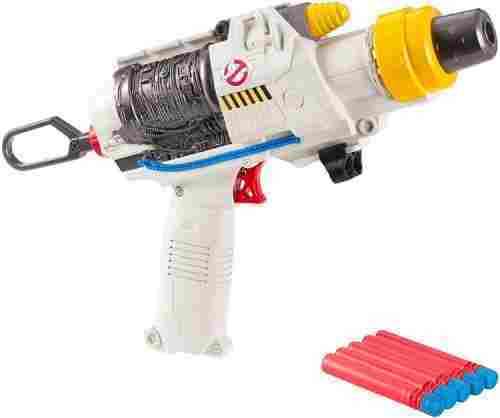 Stop the specters with this mighty Proton Blaster from BOOMCo! Operating with the basic technology of most NERF-like guns, this little guy packs a mighty punch. With five included darts, you can rapid-fire your ammo up to 70 feet! It’s compact and easy to carry, as well as being easy to load, so little ones can handle it by themselves. Be cautious about how close you stand to your target, as this does have some pretty hefty power on it, and shooting close range might hurt. 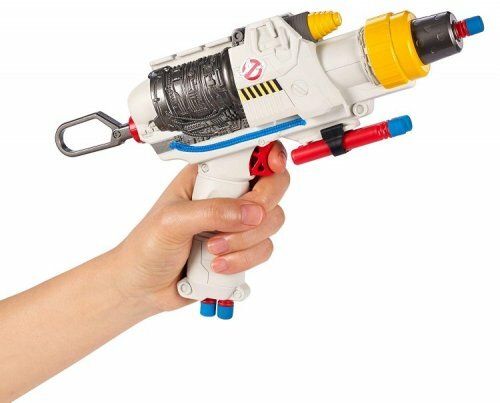 The Proton Blaster features authentic movie details and places to store additional “bullets.” The ammo is slim and in short supply with only five darts, so consider ordering additional ones upfront just in case any get lost in the crossfire of fun. 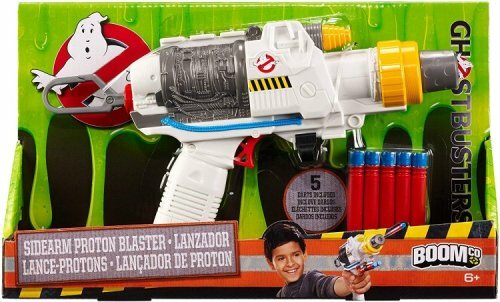 Get your kids up, moving, and busting those ghosts with this awesome blaster! If you’re looking for an excuse to engage in more active play, buy a few of these little blasters and take your fun outside. They’ve got a solid range on them, so you can run and shoot to your heart’s content outdoors. Kids will love getting to play together with family and friends, and these proton blasters will get them up and moving. 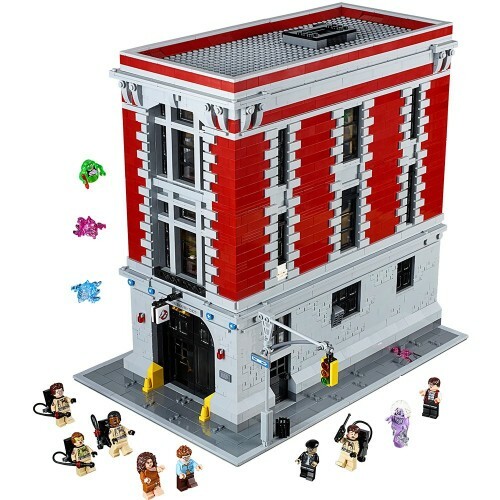 This set is great for fans of the original movie. It allows you to play first as Venkman, and then as any of the original four, any time you’d like. The game itself is quick and fun, and the roaming level allows for tons of additional play. LEGO Dimensions gives you the power to combine all of your favorite characters, no matter what franchise they might be from. Each pack comes with one buildable LEGO figurine and two accessories. 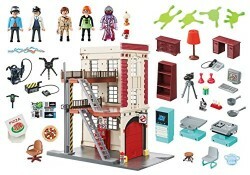 This Ghostbusters set includes Peter Venkman, his Ecto-1 (the car), and a ghost trap. For even more in-game adventures, expand the fun with a level pack which contains a whole new mission-based level for your character. The Ghostbuster level is essentially a quick play-through of the movie, and once you beat it, it opens up the Ghostbuster world for free roaming, as well as the ability to play as any of the four original characters. All of the sound clips are taken straight from the original movie, so get ready for some serious nostalgia. This set will work on any platform and is not machine-specific, so enjoy it no matter what system your family prefers. This game is a great way for your child to work on problem-solving skills, logic, and hand-eye coordination. It provides both a narrative-based level as well as a roaming level, so your little one has hours of fun ahead of them. If the Proton Pack with blaster is a very important weapon for all ghost busting individuals, the ghost trap is equally important. Just look at the logic. If you were able to catch a fish but you don’t have a bucket to put it in, will you be carrying home your catch dangling on its hook? While this is possible, it would clearly be an utter waste of energy and resources. In like manner, catching a ghost requires a vessel in which the ghost can be contained in, even temporarily while being transported to the Ghostbuster headquarters for processing. That’s why young phantasm hunters will need the Ghost Trap Tin Lunch Box. We know we said toys. So how come we included a lunch box? Well, this is the only lunch box that also serves as a great containment unit for wandering phantasms and other ectoplasms. Look at it this way. 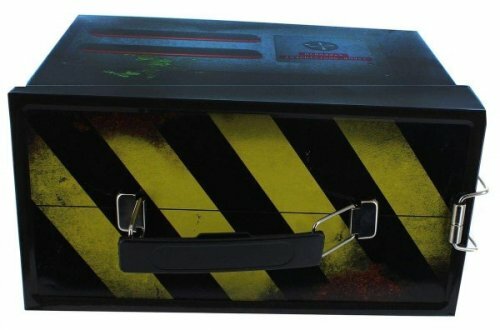 If your kid is done with his or her meal, he or she can instantly turn the Ghost Trap Tin Lunch Box into a well-detailed trap complete with Vapor Containment Strength, Vapor Max, and Particle Dispersion indicators, all printed on the body of the Fourth Castle product. Made of high quality tin complete with a metal latch and handle, the Ghost Trap is a great prop that goes well with the Proton blaster. You can find more like this in our post on the best lunch boxes for kids here. 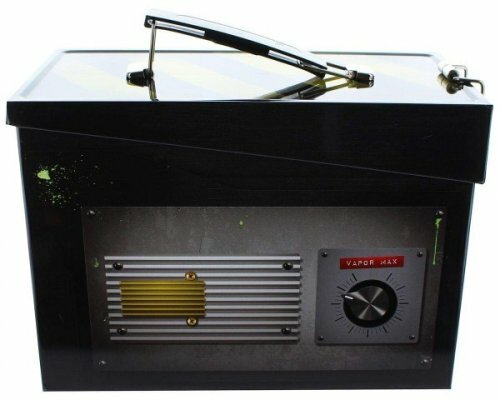 While this is Ghostbusters Ghost Trap Tin Lunch Box by Fourth Castle isn’t a typical of toy, it has a variety of uses. It can not only hold your kid’s lunch, but it can trap ghosts and carry various other items to aid your kid in ghost hunting. This multifunctional Ghostbuster box is simple to clean as it made of tin and can easily be wiped down with a damp wash cloth. Kids may be more drawn to use this tin as a ghost carrying accessory than a lunch box due to the realistic, 3D features. While the Egon Spengler action figure is primarily designed for display purposes, it can still be an excellent toy for kids to help them relive the adventures of this famous scientist in the GB world. Hardworking and technically the genius behind the Ghostbusters, Egon Spengler is one of the coolest guys you’ll ever meet. Well, that depends on how you define the word “cool”. He is constantly fascinated with science and is focused on understanding the paranormal activities that occur in the city of New York. He may not be able to articulate his emotions very well but he is generally a very likeable person. He is cool-headed, too, and has also shown flashes of bravery more than once. Egon may be serious but he has a unique, almost disturbing sense of humor. He can easily let out a wisecrack and is never immune to anger. For the fans of Egon Spengler, we thought that it would simply be unjust not to include the 7-inch action figure of this beloved, often misunderstood phantasm scientist. The Egon action figure comes with a very realistic design from the getup to the proton pack to the blaster and even the wrinkles on his jumpsuit. Collect Egon as well as Peter and Dana to complete your Series 2 of these Diamond Select Toys. The package already comes with a section of the diorama for the rooftop temple. Collect the three and you’ve got a very fantastic diorama right in your kid’s bedroom. The details of Egon Spengler and the diorama are very realistic looking and will provide your kid with fantastic ideas for imaginative play. This action figure by Diamond Select comes with two pairs of interchangeable gloves as well as two pairs of interchangeable hands. These additions are awesome so that your kid can adequately reenact movie scenes and create their own. Kids who love the Ghostbusters franchise will enjoy Egon Spengler as he is the most expert architect of ghost containment, trapping and detection technology. Egon Spengler Select Action Figure by Diamond Select makes seven distinct sounds to stimulate your kid’s auditory senses. The accessories included and the attention to detail in each piece makes this set even more fun for children. The pieces will provide hours of pretend play, thus aiding in the development of your child. Are you hearing strange noises coming from your attic? 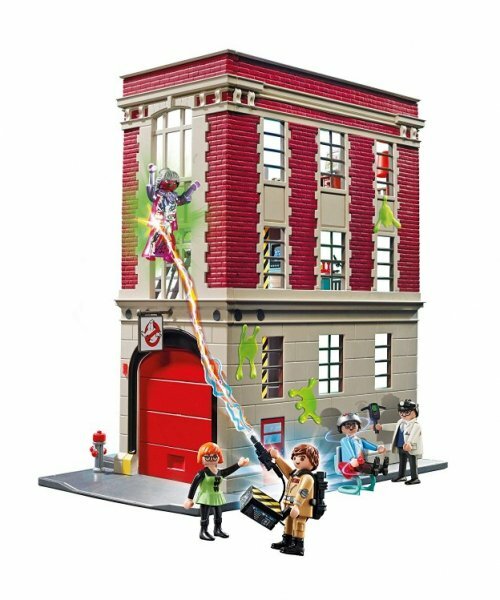 Your child can put those noises to rest with the Ghostbusters gang in the Playmobil firehouse. Your child can help Spengler create a ghost fighting concoction or assist Stantz in watching over the library ghost. Janine will be answering all of the calls and will let the team know when it is time for their next ghostbusting adventure. The fireman’s pole makes it easy for the team to get to the garage quickly when it’s time for their next mission, no matter what story of the firehouse they are on. The team comes dressed in their ghostbusting uniform and with their proton packs on their back. 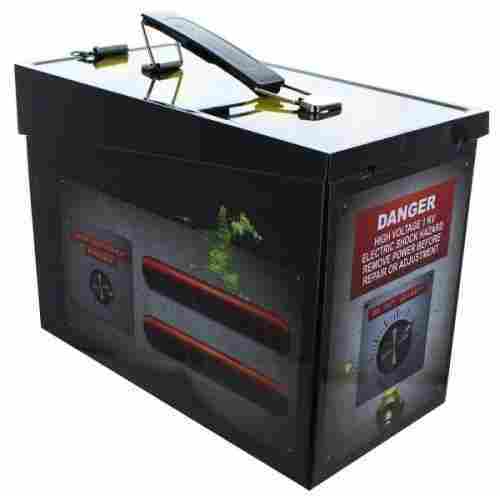 The firehouse is equipped with a ghost containment unit, which is stocked with a variety of ghost catching accessories. A proton wand, ghost trap, and silicone slime splatters are just a few of the things inside the containment unit. No ghost stands a chance with your child on the case. As your child engages in pretend play they will be stimulating their imagination and creativity. The firehouse is big enough for multiple children to enjoy so your child can improve their social skills and play with friends. The garage is designed to hold the Ecto- 1 car, which is a great feature for those fans who already own it. Children between the ages of 6-15 will have no trouble building this set on their own and will gain confidence after they finish. It’s incredibly detailed. Kids will love how interactive it is and how many different stations there are to play at. Adults and true-blue fans will appreciate the amount of movie references included in this set. Open the building to find a darkroom, laboratory, fire poles, and living areas, including a kitchen, sleeping quarters, bathroom, common area, and garage bay. Recreate iconic scenes from the movie, or make new adventures. Just have your phone handy in case you run into any spooky specters on the way. Construction sets help children to sort, categorize, problem-solve, and follow instructions, as well as develop and fine-tune motor skills. 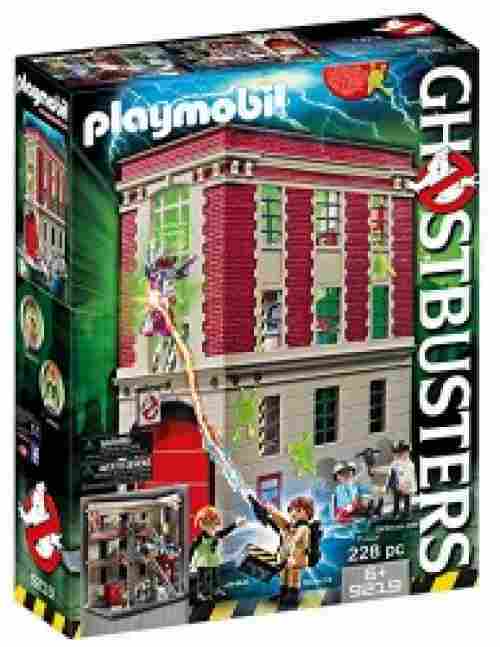 Once this set is built, kids can also engage in creative and imaginative play with their favorite Ghostbuster characters! It’s a fun, nostalgic way to help your children save up and have somewhere trustworthy (and trendy!) to put their money. The vinyl bank features a slot to put in cash and coins. To empty the bank, unscrew the head and flip him over. He stands evenly, so put him up on the dresser or a shelf, and let this cute-but-catastrophic pop-culture icon guard your child’s savings. Financial responsibility is a lifelong skill, but one that can be implemented starting at an early age. Allowances, compensation for housework, money from selling lemonade or holiday gifts--wherever your child is getting their dough, the Stay-Puft Marshmallow Man is here to make sure it stays safe while they save up. The LEGO Dimensions provides an opportunity for kids to use their creativity and imagination to the fullest. They will be using a host of characters and vehicles that will require their cognitive and logical thinking skills. A strange and powerful vortex wreaked havoc in several different lego worlds and swept away many of the people. 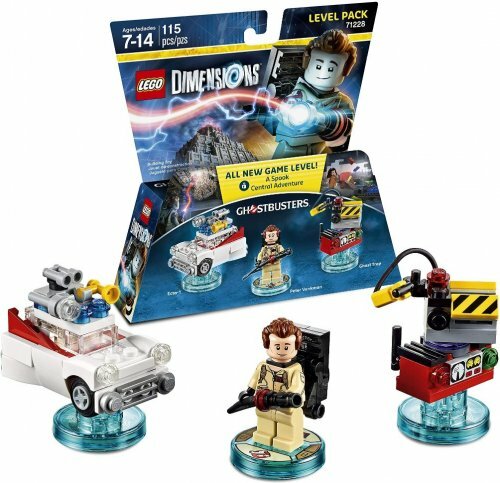 Lego characters from DC comics, ghostbusters, and many more join forces in the game Lego Dimensions to save their friends. Characters from different worlds are able to interact with each other. This particular listing is for the Ghostbusters fun pack, which allows your child to bring Stay Puft and Terror Dog into the game. With your purchase, your child will also receive 3D models of these characters that they can build. The 65 pieces are great for children between the ages of 7-14. As you purchase more expansion packs your child can grow their collection and bring up to seven characters into the game. 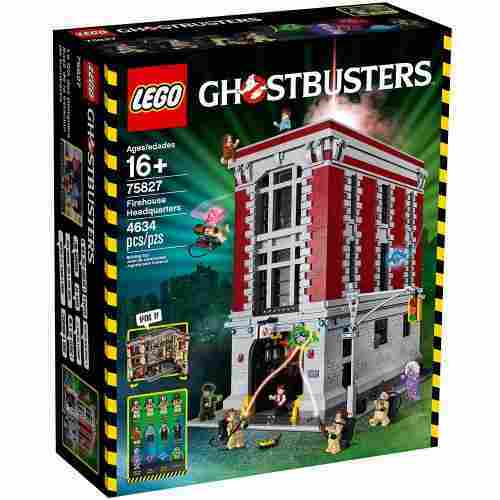 Kids can expand their creativity as they digitally create LEGO Ghostbusters scenes with this. This game is easy for kids to play with confidence but tough enough for them to feel challenged. The high quality sound and graphics are wonderful for stimulating your kids auditory and visual sensories as this is a very intriguing game to play. This is an amazing game to have if your kid is a LEGO fan, Ghostbusters fan or a fan of both for the act that it has limitless play. Dubbed as the most requested model that members of LEGO Ideas have sought, the Ghostbusters Ecto-1 is a 508-piece building play set that requires superb spatial intelligence, ability to follow directions, and an eye for detail. When completed, the ecto-1 should measure about 7 inches long, 2 inches wide, and 3 inches high; quite small if you ask us. But, for kids, it’s the opportunity to build the most iconic ghost-fighting vehicle of all time that is really priceless. 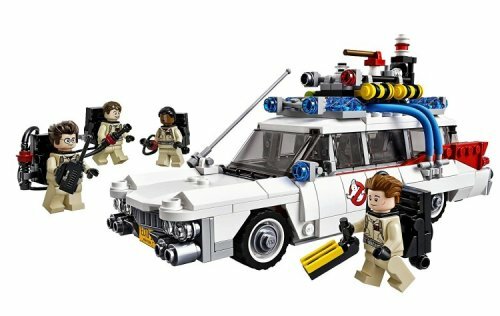 The LEGO Ecto-1 comes with the original Ghostbusters team of Peter, Egon, Ray, and Winston complete with their proton packs, paranormal detection gear, and other tools of the trade. This Cuuso fan-voted play set from LEGO is simply a phenomenal piece of engineering that oozes with absolute realism. The mere fact that kids will be able to build this can be a source of great pride in them, building their self-confidence, and improving their emotional wellbeing. 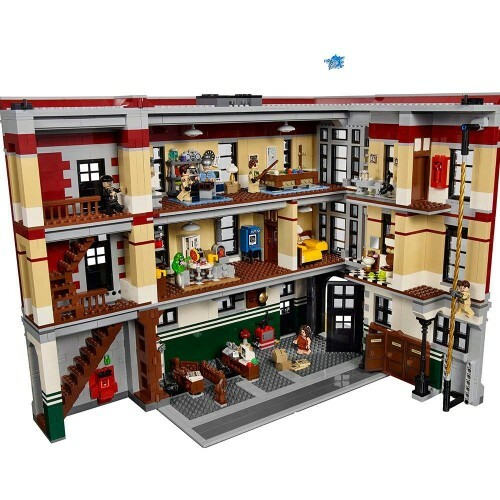 This LEGO set is incredibly exciting to piece together as it has amazingly detailed parts and is sure to please kids. Each of the specific characters have their initials printed onto them to help with assembly and character recognition. Even better, each of the characters are so realistically made that they closely resemble the actors from the movie. This amazing Ghostbusters Ecto -1 by LEGO comes with a really nice book that includes history about the film to give kids a better idea of what they are actually building and playing with. This detailed kit provides an amazing way for you and your kid to spend quality time together. From action figures to LEGOs and ghost-busting gear, each of these toys can be used in a variety of ways. Your kid will enjoy recreating scenes and making up their own creative scenes with the toys and gadgets listed above. This will keep your kid coming back to their Ghostbuster toy over and over without growing bored of it. A few of these toys on our list above are complex such as the LEGO sets, however, they are not too difficult for a kid to assemble. These toys promote confidence as kids can play with them and assemble them without having a hard time or having to ask for help which could be frustrating. Because these toys are easy for kids to play with and use, they will play with them often, which will keep them occupied and enhance their social and imaginative skills. 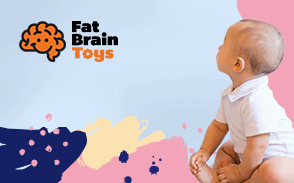 Toys that are visually stimulating play a huge part in a kid’s overall experience with it. The gadgets on our list are visually appealing and will keep your child enticed for the fact that they are realistically built and vibrantly colored. Realistic colors are very important when it comes to choosing a toy for a kid, however, so is the shape. The riveting outlines of our Ghostbusters action figures and toys encourage hands-on play as they are built on a scale size that’s easy to handle and play with. Creating a representative list of Ghostbuster toys, gadgets, and gizmos that fit well into our top 10 proved to be quite a challenge. We found out that a great number of the best-selling toys of this character were the Ecto-1 car of the ghost-busting quartet. It would simply be foolish to include four or more toys of the same kind in a list. As such, we had to consider other types or forms of toys and gadgets that we’re sure children will love and have tons of fun playing with. Everyone knows that children love to play as it is their primary means of learning about themselves and their world. If the play were to be set with rules, then it becomes a game. While there is a very thin line between play and games, children can nonetheless, benefit from both. One of the most valuable types of play activities among children is role-playing. Here are some of the surprising benefits of pretend play or role-play. When kids role-play, they don’t just simply follow the script from the movie or the animated film that they saw. They will be the ones to create their own storylines including the creation of a character that they think is best suited for the role. All of these will require a bit of imagination as some of the supposed “roles” may not really work in the real world. For role-plays to be effective, different characters must be brought to life. And because different characters will have different roles to play, kids will have to learn to communicate with other players. Communication is vital in the development of one’s social interaction skills. One of the more obvious benefits of role-playing is the use of cooperation and teamwork to get the job done. This is closely related to the development of social skills since communication and interpersonal relationships can become the foundation for effective teamwork. There will always be certain situations in a role-play in which kids will be confronted with a problem as a result of their creativity. The good thing is that the role-playing activity itself will provide the means upon which kids will use their cognitive abilities to work around or through the problem. Their logical and divergent thinking skills will also be greatly enhanced. The Ghostbusters film franchise had a great following in the 1980s. When the 21st-century version was released in 2019, kids were introduced to the characters that we once adored. You can cultivate this fascination in the same way as our parents cultivated our way back in the '80s by choosing any of the 10 best Ghostbuster toys we have shared with you. If you get a new toy for your kid, you want it to last for a lengthy amount of time. Each of the toys and gadgets on our list are made from durable materials to stand up against rough play and the test of time. Even the Ghostbusters edition of UNO cards are made from high-quality, thick paper to stay intact after frequent use. And since we’re talking about playthings for children, we had to consider the developmental appropriateness of these products as well. It was crucial that we were able to identify the developmental benefits of these products so you can feel much more confident about what you’re giving to your kids. Company reputation was also considered as this can help establish the quality of the product as well as the safety and integrity of its construction. This is especially true for younger children such as those who are below 3 years of age. Small, detachable components can pose as significant choke hazards for these young kids so it was imperative for us to ascertain that these are safe. q: Could I put the completed set of the Ghostbusters Ecto -1 by LEGO inside an aquarium? 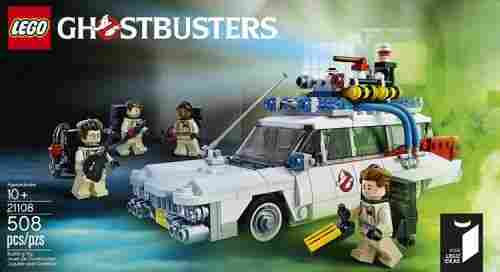 Yes, you could put the completed set of the Ghostbusters Ecto -1 by LEGO inside of an aquarium. This is a wonderful and safe way to display your kid’s hard work. LEGO pieces are safe in aquariums for both the inhabitants and the LEGO pieces themselves. LEGOs are made of durable, hard plastic and it does not consist any toxicity. The pieces will not break down due to being submerged in water. However, it is important to clean the pieces as an entire aquarium should be cleaned regularly to prevent build-up. q: How can my kid benefit from play with action figures as most are prone to a life in a box or on a shelf? Your kid can benefit from playing action figures in several ways. In addition to adding to their collection, these action figures are so fun and detailed that you will find your kid constantly removing them from the shelf to play with them. Kids can engage in role-playing, physical play and imaginative play as they re-enact Ghostbusters scenes. 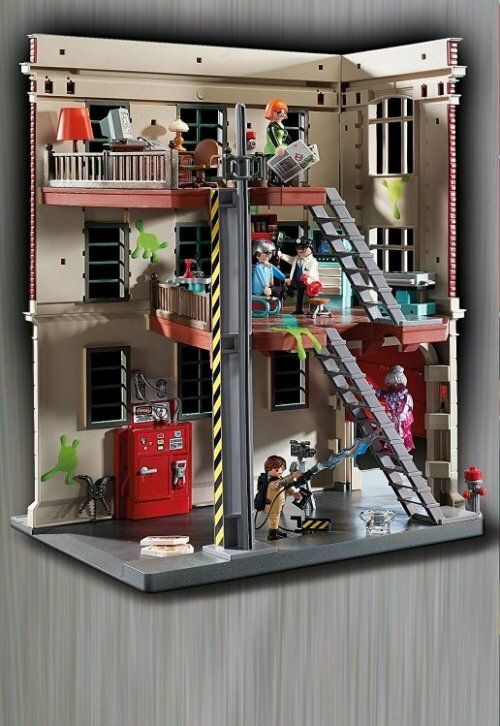 Moreover, kids can create their own scenes and even put together their very own version of the Ghostbusters movie as they play with these detailed, realistic action figures on our list above. 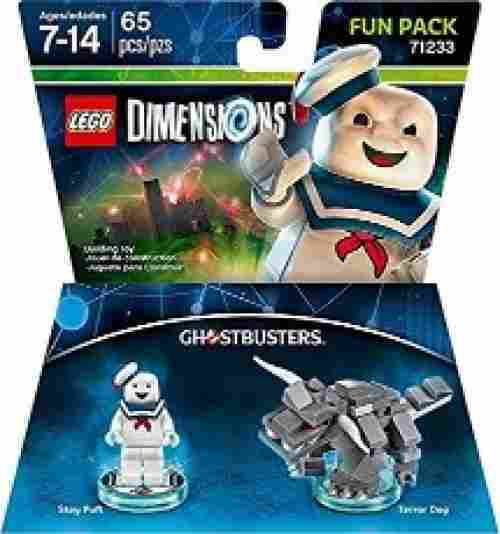 q: LEGO Dimensions Ghostbusters Stay Puft Fun Pack for PlayStation 3 by LEGO be used with the XBox One? 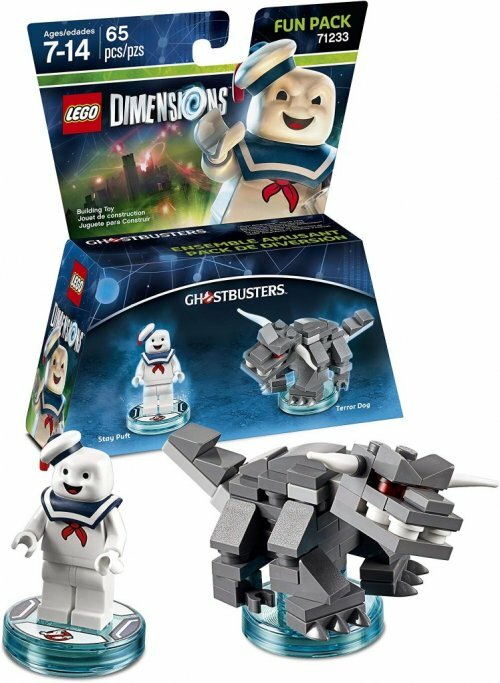 Yes, in addition to the PlayStation 3, these particular LEGO Dimensions Ghostbusters Stay Puft Fun Pack by LEGO can be used on any console such as the Nintendo, PlayStation 4, Xbox One and many others. It is very important to make sure that you are not purchasing a console-specific Fun Pack if you want to use this toy with any type of console.